The facility is the target of a lawsuit over inhumane and unsafe conditions. Local Democrats not consulted. Above: The city jail on East Madison Street was first opened in 1859. This part of the original structure would apparently not be torn down. 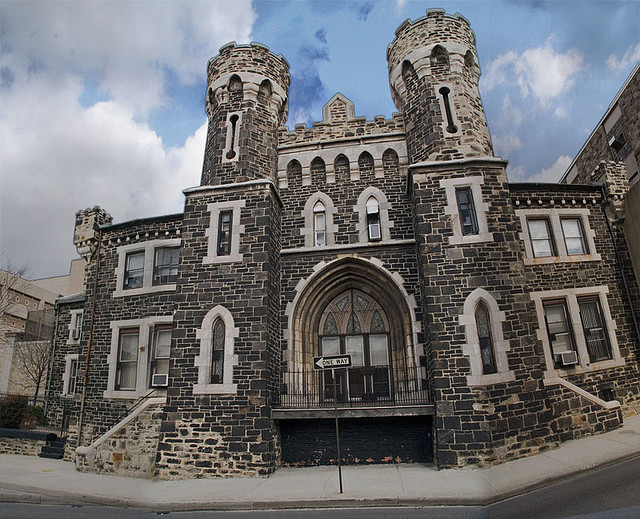 The city jail, a forbidding fixture of the East Baltimore skyline for more than 150 years, may be torn down under a plan announced this afternoon by Maryland Gov. Larry Hogan. Calling the facility “a disgrace” and “deplorable,” Hogan said the state facility would be shut down as soon as possible. The roughly 900 male inmates at the East Madison Street facility will be transferred to nearby facilities. The jail, formally called the Baltimore City Detention Center, is the target of legal action by the American Civil Liberties Union and the Public Justice Center. Last month, they asked a federal judge to reopen a lawsuit against Maryland – which took over the jail in 1991 – over inhumane and unsafe conditions. The groups allege that inmates suffering from HIV and diabetes have been denied life-sustaining prescription medication. The court filing also described cells infested with mice and cockroaches, moldy showers, poor ventilation and cracked toilets. He declined to give specifics of the inmate transfers, citing security reasons. The jail, operated by the Maryland Division of Corrections, has a long history of violence and corruption. Two years ago, federal and state authorities announced dozens of indictments of inmates and corrections officers on allegations of widespread graft, violence and improper sexual contact between prisoners and guards orchestrated by the Black Guerrilla Family gang. Following the indictments, a state legislative commission endorsed a half-billion dollar plan to knock down the jail and rebuild it. Hogan said today he plans to raze the facility, which was opened in 1859 and mostly houses inmates awaiting trial. His announcement caught City Hall and local Democrats by surprise, who said they were not consulted by the Republican governor beforehand.